CrossFit is filled with a multitude of full body exercises and one of the most utilized compound movements is the thruster. A compound movement, or multi-joint movement, the thruster uses both upper body and lower body strength. Jennifer De Veaux, Head Coach and Owner of San Diego Athletics says, "the thruster is a full body exercise that develops strength, coordination, explosive power, muscular endurance, speed and balance." The thruster is also a functional movement, meaning that the exercise is a natural movement that can be replicated in real life. The movement of the thruster is similar to the movement of picking up a child, lifting groceries or putting items away overhead. Perform a CrossFit thruster with your feet shoulder width apart and with a barbell in your hands. 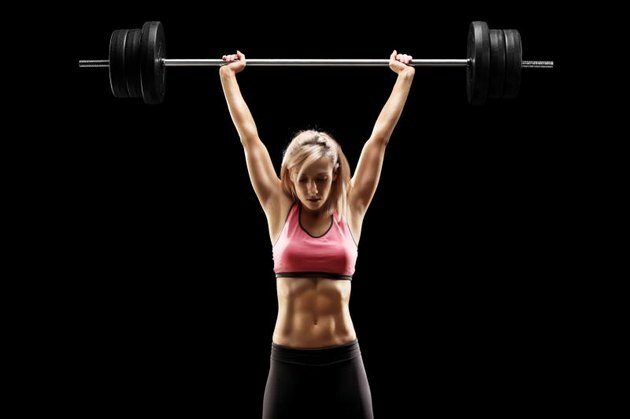 Raise the barbell up to your collarbones. With a proud chest and engaged core muscles, lower your body down into a deep squat, allowing your glutes (if hip and knee flexibility allows) to drop lower than parallel. Drive your elbows up as you push away from the ground to return to standing. Just as your hips are about to extend to standing, squeeze your glutes and push off of the ground, allowing the bar to float up overhead. Lower the bar to collarbone height and repeat the movement. Because the thruster the power of the movement stems from the squatting action of the lower body, you'll activate the glutes, quadriceps and hamstrings. The secondary muscles used are the core muscles, which are activated to keep the body solid and upright throughout the movement to prevent injury. Lastly, the shoulders, or deltoid muscles, are utilized to raise and lower the bar overhead. While the thruster may appear as though the shoulders are heavily utilized, it is the power in the glutes and legs that “thrust” the bar overhead. Common mistakes include stopping at the top of the squat prior and relying on the shoulders to push the bar overhead. De Veaux says, "a lot of people press too early and don't wait for the hips to initiate driving the bar off of the shoulders." The thruster movement should be one fluid motion from bottom to top and utilize the glutes and legs to power the bar overhead. Another mistake to avoid is relaxing the core muscles during the movement and allowing the back to curve. It is imperative that the core muscles are engaged during the entire exercise to prevent injury and to allow the power of the lower body movement to be translated into the overhead movement. De Veaux says, "make sure you brace those abs hard through the entire movement to protect the spin and work your core."